Here you will find courses of the Bachelor’s degree programme in Aerospace. The field of study is extremely broad and exciting and is not confined just to the aerospace industry. Besides acquiring the specialist know-how you will also learn to work in teams, to make compromises, to search for solutions to complex problems and to communicate effectively. 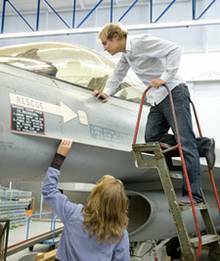 The degree programme in Aerospace Engineering is the only one at TU Delft to offer a comlete English-language Bachelor’s degree programme. In the first two years all students follow the same curriculum. In order to help you progress in your studies, in the first part of the degree programme you receive support from a senior student, your mentor. In the first year you can select either Dutch-language or English-language tuition, while from the second year onwards all teaching takes place in English. This is an excellent preparation for your further studies and the international job market. On successfully completing the degree programme you receive a Bachelor’s degree, which is also an excellent point of departure for further study in a Master’s degree programme. This can be done at our faculty, at another Master’s degree programme at TU Delft, or abroad as well. Aerospace Engineering offers a very broad field of study. What’s special is that we study all disciplines: from aerodynamics with the help of wind tunnels through to precise calculation of satellite orbits, from materials testing in laboratories through to designing revolutionary new helicopters. We are also leaders in the field of earth observation. Advanced geographic information systems based on GPS (and soon Galileo as well) have been developed and tested at our faculty. In addition to acquiring the aerospace expertise, you will also learn to work in teams, to make compromises, to search for solutions to complex problems and to communicate effectively.